I want to initially focus on the Isokern fireplaces and chimney systems of this English Cottage style home because that is what really caught my attention and was one of the features that immediately signaled that this was no “run of the mill” home. Isokern fireplaces and chimney systems are made of volcanic pumice mined near the Arctic Circle from the Hekla Volcano in Iceland. Isokern fireplaces are not kits like I’m used to seeing in almost every home we visit. I was intrigued by the feel of the material and the masonry methods involved in the installation process. The insulating properties are superior to practically anything available. The herringbone firebrick design on these fireplaces really set them apart from the majority of firebrick that is seen in kits. From the looks of the finished Isokern fireplaces on their website, I am looking forward to seeing what all of the fireplaces and hearths in this home will look like. There are 2 chimneys venting 3 fireplaces including one 36″ and one 42″ (both upstairs), and a mammoth 48″ in the basement. The DM or dual module chimney system is a component based chimney system that has an inner liner and an external casing. The DM 54 system has an inner liner and an 54 cm external casing.The modular design of such a system allows for more diverse , lightweight applications for fireplaces and other applications. The Isokern chimney systems are used for all gas-fired appliance and solid fuel burning applications. Isokern DM chimney components are built with tongue and groove construction, enabling a tighter fit for maximum safety and consistent installations. 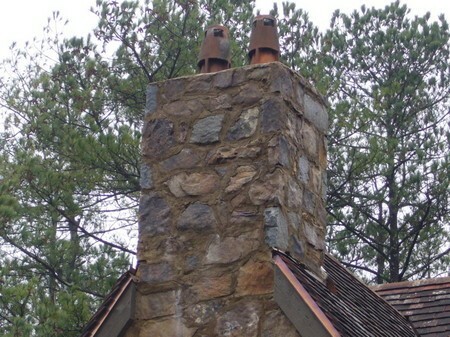 Due to its pumice based construction, all DM 44 and 54 chimney systems are the highest rated residential solid fuel chimney on the market. Apparently, all pumice is NOT created equal. It appears that the builder of this home has installed the Magnum series from Isokern with the straight-backed design and the firebrick is mortared in a handsome herringbone configuration. Earthcore Industries is the North American distributor of Isokern. So if you’re interested in having an Isokern system installed in your new home you can find a distributor by clicking here. If you find this article interesting, you may want to check out the whole series of posts on this English-cottage style home and all of the beautiful craftsmanship and materials that go into constructing it.